When shopping for that next pair of shoes, a personalized experience is what we’re all looking for. From shops serving their communities since the 1930s to spots with hard-to-find sizes, the great shoe stores of Mississippi have you covered. Here are our 10 favorite shoe stores in the state. Specializing in baby and kid’s shoes, this sweet boutique makes shopping with your kids enjoyable and non-stressful. 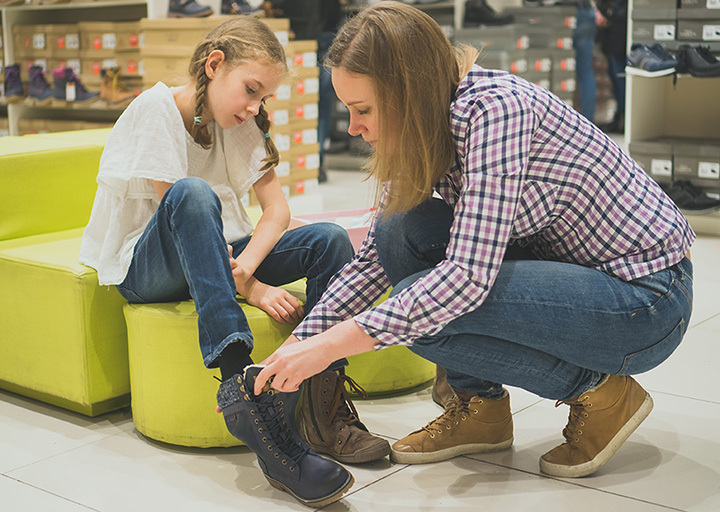 Customers love the attentiveness of the staff in helping them size their kiddos’ feet, which is not as easy as it sounds. Parents love the variety of colors and styles, knowing they’ll likely walk out with what they came looking for. This men’s footwear haven has been fitting feet since 1942, and they’ve got a long-standing tradition of excellence backing their name. They’re known for having hard-to-find fits for wide, narrow, and large feet that most chain stores never stock. From work boots to western boots, casual to dressy, their variety gives you plenty to choose from. This place is a piece of Tupelo history, having opened its doors just a few years after Elvis became an international sensation. Their selection has certainly changed since then, but their commitment to stocking top quality shoes for children of all ages has not. Inside you’ll find a treasure trove of high-quality shoe brands alongside jewelry, accessories, dolls, toys, candles, and more—you’ll want to take some time to explore. Aptly named, this place is sure to become your new favorite shoe store. Their boutique-style setting makes shoe shopping fun, offering the look and feel of a high-end store with an inventory to match. Pair your new shoes with a new handbag or other accessory to complete your look. Hard to find sizes are no match for this shoe store. They cater to your unique feet, making sure you’re buying the right size for the best experience. Their huge variety of styles year-round will leave your feet wanting for nothing. They opened their doors in 1937, and they’re not closing them anytime soon. These folks know their way around a shoe, and can put their expertise to work for you in helping you discover what quality footwear should look and feel like. Their customers agree the prices here can’t be beat. Fashionistas hoping to stay ahead of the trend curve won’t want to go anywhere else for shoes. They’ve got all the latest styles and colors to outfit your shoe arsenal like no other store can. Even better, this boutique also carries the latest trends in apparel so you can score a complete outfit that on point from head to toe. It doesn’t matter what style of shoe you’re looking for, you’ll find it here. Their impressive inventory is only matched by their superior service from staff that cares you get the shoe you’re looking for. If you don’t live near Meridian, they’ve got a full suite of shoes online that can be shipped directly to your door. Every athlete will want to discover the greatness inside StinkyFeet Athletics. Offering some of the best names in running shoes, you’ll find everything you need to fuel your passions and push onward in your next race. They’re more than just a shoe store—they’re an entire fitness community, and you can’t help but become inspired when you visit. Part shoe store, part sportswear retailer, Goldberg’s carries some of the best lifestyle shoe brands. Names like Chaco, Nike, and Timberland are no strangers to the shelves here. Customers love that they can expect a high-quality selection when they shop.